My challenge-within-a-challenge (in which I must attempt to watch 12 renowned films within the next 12 months) returns for a third year, this time with a natty subtitle — or for short, WDYMYHS:SoOaHaDotO. Yeah, let’s not call it that. Why the unwieldy subtitle? Well, since its inception (in the distant past of two years ago), WDYMYHS has been torn between recommending critically-acclaimed must-sees and widely-popular must-sees — the first year erred towards the former, in reaction the second year skewed to the latter. This year, I had an epiphany: why make a list that tries and fails to serve two masters, when you could just make two lists? No, I’m not going to try to watch 24 specific films (I know my own limits. Well, I don’t, but that’s one I know is doomed), but rather two lists of six — one of critically-acclaimed films, one of more populist movies. Hence the Clever subtitle. As with last year, we’ll get straight to the two lists, and follow it up with not-for-everyone analysis of how they compare to previous years and an overlong explanation of how they were devised. Good lists? Bad lists? Please do share any and all opinions. As per normal, my progress will be covered as part of the monthly updates. I’ll come to how all of that was compiled in a minute, but first a few (well, quite a lot, because you know I like these bits) observations. First, those scores — pretty meaningless without knowing the method, I know (we’ll come to that, jeez! ), but you can’t help but notice how high A Clockwork Orange’s is. Here’s the best I can do for perspective: what I’m calling “the theoretical maximum” for the Populist List is 1,636 points (it’s actually possible to score more, but let’s not get into that). Compared to that, A Clockwork Orange scored 68.2%. Sound low? 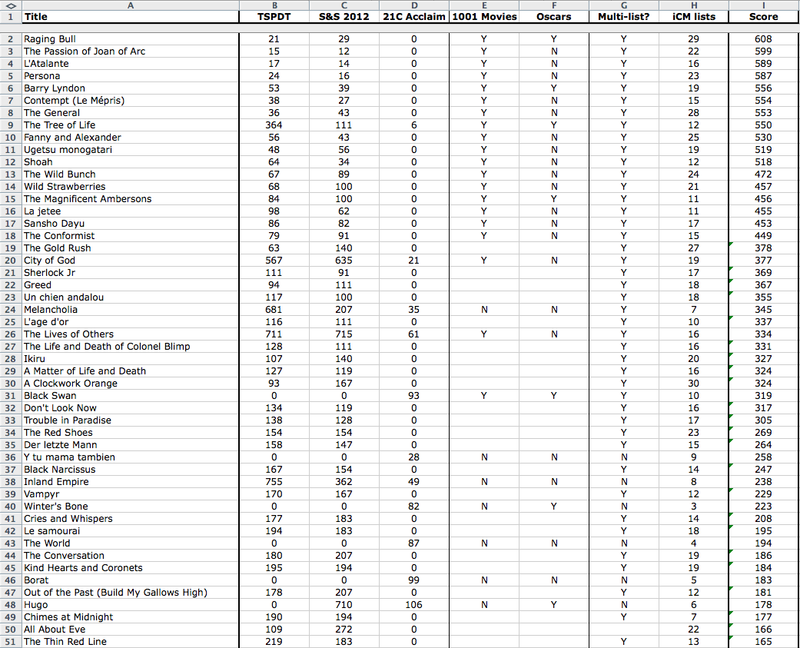 The film in second place, City of God, comes to 47.8%, while the last included film, Princess Mononoke, has just 29.3%. The world really wants me to watch A Clockwork Orange. The Critical List is much closer: the “theoretical maximum” there is 908, from which Raging Bull has 67%, whereas last-place The General has 60.9%. Long-time readers will surely have remarked on the inclusion of Raging Bull. It was part of 2013’s inaugural list, but I failed to watch it. It was excluded from re-inclusion in 2014’s, but I intended to watch it of my own accord (as it were)… and failed. I decided a year was long enough to hold out — especially as it topped the Critical List and came second on the Populist List — so it’s back in. I think this will be a new rule going forward: if I fail to watch a film, it has to ‘sit out’ the next year, but is eligible for inclusion the year after. For what it’s worth, The General and The Passion of Joan of Arc are the two oldest films to have featured in WDYMYHS, and L’Atalante is fourth (third being City Lights from 2013’s lot). That extreme aside, this year’s list are quite spread around: whereas 50% of 2013’s were from the 1950s and 50% of 2014’s were from the last 20 years, no such pithy evaluation can be made this year. The ’60s and ’80s present three films each; there’s the two from the ’20s already mentioned; and then one apiece from the ’30s, ’70s, ’90s and ’00s. The 76 year gap between the oldest and newest pips 2013’s 53 years and 2014’s 73 years. It’s also worth noting that there’s a greater variety of languages and countries of production included this year. Non-English films made up three in 2013 and two in 2014, but this year it’s six — half the list! That said, The Passion of Joan of Arc is actually silent, and I may well watch the Neil Gaiman-penned English dub of Princess Mononoke, both of which would take the wind out of these sails a bit. The countries of origin are undeniably spread, though. Ignoring co-production technicalities, last year only offered two non-American movies, and the year before four (the three foreign language ones plus Lawrence of Arabia, which I’ve got down as a US/UK co-production but am counting as British). This year, the US is still highest, but only with four films — there’s France thrice and the UK twice*, as well as Brazil, Sweden, and Japan. As for directors, Kubrick’s back again, in the form of A Clockwork Orange (obviously). No surprise there, as it was ranked very highly in each previous year but eliminated under the “no repeat directors” rule. Full Metal Jacket and Barry Lyndon also made their way into the Top 6s (the former for Populist, the latter for Critical), but were similarly eliminated. I guess one will end up on 2016’s list (unless I drastically change how I do this… which I might). After sitting out last year, there’s a return for Bergman, in the shape of Persona. For the first time, no Hitchcock or Charlie Chaplin — they both had multiple entries near the top in previous years, but this time Chaplin managed 18th on the Critical list with The Gold Rush, while Hitchcock’s first appearance is on the same but way down at 70th. 70th! On the Popular list, it’s not until 84th. Have I seen all the great Hitchcock movies already? There’s an awful lot of his films I’ve not seen, and I thought some were well-liked (whither The 39 Steps? **), so I’m quite disappointed about that. Other noteworthy directors included are John Carpenter, Carl Theodor Dreyer, Terry Gilliam, Jean-Luc Godard, Buster Keaton (taking Chaplin’s place? ), Hayao Miyazaki, Martin Scorsese (for the second time… with the same film), and Jean Vigo. The list is rounded out by City of God’s Fernando Meirelles, who made the excellent The Constant Gardner before seeming to slip back into obscurity, and To Kill a Mockingbird’s Robert Mulligan, who I don’t know anything about and (to be frank) doesn’t seem to have helmed anything else noteworthy. This year’s scoring system is heavily based in last year’s, with some tweaks and changes, for various reasons. The most obvious is that there are two lists, using two completely separate sets of contributing lists. The basic principles are the same for both, though: I took the top 250 entries on each contributing list and those films received a score out of 251 for their position — so #1 would score 251 points, #2 would score 250, and so on down to #250 scoring 2 points. Many of the lists go past 250 entries, however, so any film lower than that (but which came to my attention by being in the top 250 of a different list) received a single bonus point just for appearing. There was a further 50 point bonus for appearing in the top 250 of more than one list. Last year that was an extra 50 points for each additional list; this year it’s a one-time deal. As with last year, there was an additional bonus based on the number of ‘official lists’ a film appears on at iCheckMovies.com — i.e. A Clockwork Orange is on 30 lists, so got 30 points. They Shoot Pictures, Don’t They?’s 1,000 Greatest Films (2014 edition). Sight & Sound’s 2012 poll, using the combined votes of both critics and directors. I don’t believe this is listed on S&S’s website, so I used the results as they appear on iCheckMovies, taking into account the shared vote numbers (as detailed at the top of the link). So, for a random example, #166 would score as if it were #154. The 21st Century’s Most Acclaimed Films, as compiled by TSPDT. As mentioned before, the main TSPDT list is biased against recent films, so this was added to help correct the balance. 1001 Movies You Must See Before You Die — the edition currently on iCM, which lists movies released as recently as 2013. This list is unranked, so anything that had been noted due to the previous three received 50 bonus points for an appearance here. Academy Award Best Picture Nominees. Similar to the above, anything featured here received 25 bonus points. Finally, to help swing the list further in favour of recent films, the top 100 of the 21st Century’s Most Acclaimed received another 25 points. Fat lot of good it did any of them. Now, here’s an interesting thing: I very quickly got bored doing the maths on all this. The previous two years, I’ve worked it all out in my head as I went. Year One, very easy (A+B ÷2); Year Two, more complicated, but doable; Year Three, two whole sets of rules and so many films…! So I spent an afternoon learning a bit more about how Excel works and got it to do it all for me. Imagine an evil laugh here. That does everything I just described, automatically, when the correct values are entered in the correct columns — i.e. the ranking for each list, plus Y or N for 1001 Movies and Oscar noms. I’ll be frank, this is one reason there’s only the single multi-list bonus this year — that’s what I wrote into the code, and when I remembered later that it wouldn’t be adding another 50 for the third, fourth, etc, lists, I frankly couldn’t be bothered to work out how to do that. I’d wager it can be done, though. The IMDb Top 250 — aka the movie list. Well, until TSPDT came along. Now I guess it depends on your personal preference which is more relevant. This changes all the time, so was very much the version hosted by iCM on 5th January 2015. Empire’s The 500 Greatest Movies of All Time, commonly known as the Empire 500. Supposedly “the most ambitious movie poll ever attempted”, it was conducted by Empire magazine in 2008 and features the opinions of “10,000 Empire readers, 150 of Hollywood’s finest and 50 key film critics”. Empire’s The 301 Greatest Movies of All Time, aka the Empire 301. Technically the new version of the above, held last year to mark Empire’s 300th issue. Arguably not as good. As you can see from the numbers up above, some films have moved around a lot. 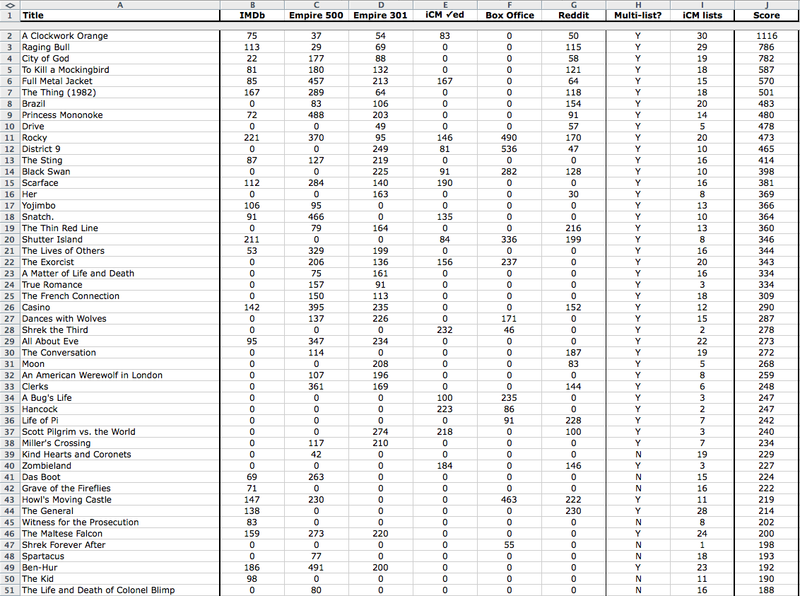 iCheckMovies’ Most Checked, being the movies the greatest number of iCM users have seen. I think one of my most-complete lists, as I’ve seen 209 of the 250. The All-Time Worldwide Box Office chart, not that it had any bearing on the final selection (you’ll note none of them are on it). The Reddit Top 250, in which Reddit users have picked their favourite movies. Constantly updated a la the IMDb version, I believe. I don’t expect you to understand or have a use for that, I’m just showing off. And so there we have it! It felt less complicated a system than last year to me when I set out, I think because last year I was working out/making up all the rules and this year just tweaking and re-applying them. Making Excel do the heavy lifting for me, though, that was new and tricky, but worth it. This entry was posted in 2015, Editorials, statistics and tagged 2015, A Clockwork Orange, Brazil, City of God, Contempt, L'Atalante, Le Mépris, Persona, Princess Mononoke, Raging Bull, The General, The Passion of Joan of Arc, The Thing, To Kill a Mockingbird, WDYMYHS, What Do You Mean You Haven't Seen by badblokebob. Bookmark the permalink.